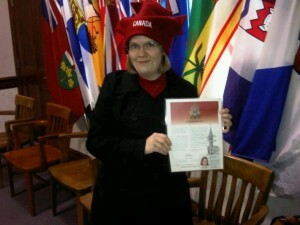 So on October 7, I became a citizen of Canada. The ceremony was at 1:15PM at the Citizenship and Immigration office in Kitchener- they have a citizenship court there, actually the same building where I took my citizenship test. When I arrived (along with my husband, and my friend Carrie), a clerk checked me in, took my Permanent Resident card away (it was weird to give that up after basically guarding it with my life for 3 years) and gave me some booklets about Canada to take. We went into the court itself and sat down- there were a good number of people there. They schedule the ceremonies for 45 new citizens at a time, but there were 49 of us there, with guests. Once we were all checked in and seated, the clerk walked us through how the process would go. All through this, the flat-screen tvs in the room were playing one of those montages of images of Canada. Eventually, everything was set to go and the clerk had us rise for the judge to enter. My ceremony was presided over by Judge Sharon Robertson, a former educator. She gave a speech, telling us about some of her background and talking about the importance of the occasion and the rights and responsibilities of citizenship. Then she administered the oath, which we took in English, and French. A representative from the MP of the area spoke and gave out little cards of congratulations. Then each new citizen was called up to get their citizenship certificate, shake hands with the judge, and sign the oath paperwork. There were people from 20 different countries at my ceremony, including Northern Ireland, England, Russia, Bosnia and Herzegovina, Afghanistan, Pakistan, Kyrgyzstan, Colombia, Mexico, USA, Romania, Nigeria, China, Netherlands, Germany, India, Albania, I think Turkey, and a couple of others that I don’t remember. After the certificate presentation was over, we all sang O Canada, our first time singing the anthem as Canadians. Soon after that, we were finished. After the ceremony, I had to go straight down to the passport office, because I’m travelling out of country soon, so I needed a passport right away in order to get back in. A bunch of others from my ceremony did the same thing. 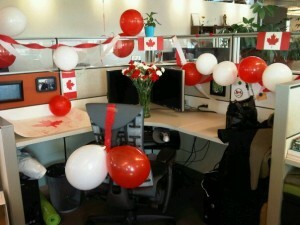 I’m a proper Canadian now! Once I got back to work, I found out my coworkers had done this to my desk. Hooray for Canada! For people curious, I am a US citizen by birth and am retaining that citizenship as well. http://www.jenniferreneehill.com/blog/wp-content/uploads/2016/04/jrh-logo.png 0 0 Jenny R. Hill http://www.jenniferreneehill.com/blog/wp-content/uploads/2016/04/jrh-logo.png Jenny R. Hill2010-10-14 21:14:592010-10-14 17:50:58I'm a dual citizen!